Earlier in the year I got in contact with one of my old lecturers from Monash University in Melbourne to propose the idea of inviting forth year student teachers to carry out their teaching rounds here on Groote Eylandt. In the weeks that followed, I was required to make a list of ‘potential risks’ associated with living on the island for my proposal to be considered by the head of Student Experiences. As I listed ‘crocodile attack’ and ‘stray dog mauling’ in the risk management plan, I laughed as I imagined the reaction of the city slicker responsible for weighing up the probability of such events and detailing some preventative measures. Months passed, ‘necessary’ documentation was slung back and forth and just as Adrian and I established some sort of chaotic routine, there were two students scrambling for a spot on our two-seater lounge. We are now into our second week with the students; hence why I haven’t had time to update the blog. Their names are Mel and Meg. As you can see from the photo below, the poor girls have developed island fever. Not really. 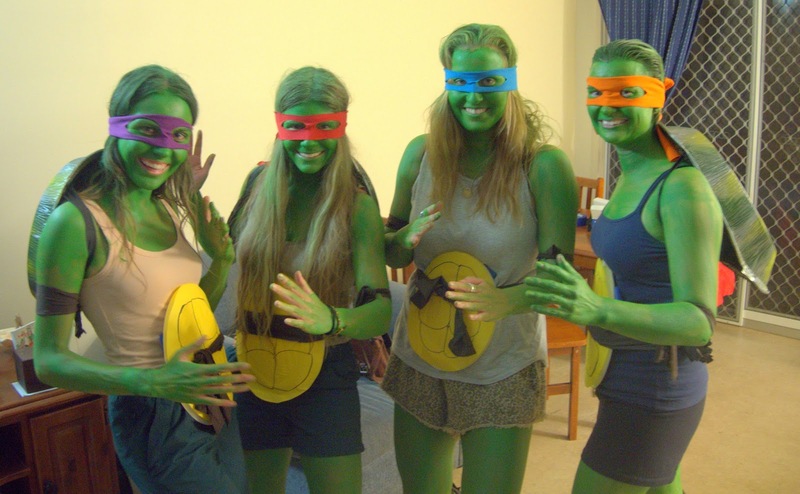 On the weekend we went to a trivia night and persuaded them to join our team ‘The Ninja Turtles’. ﻿Going back to the weekend before, we were out at Umbakumba for the weekend; attending the One People, One Voice Fesitval. It was a three-day event celebrating and exhibiting the Indigenous culture and lifestyle. On the Friday night, their was a lantern parade which involved all the visiting children carrying glowing hand-made lanterns along the pier as the sun when down. The lanterns were made of cane, baking paper, PVA glue and battery-powered lights. It was a pretty spectacular sight. This was followed by each school singing a song produced by the students and the STAMP musicians. Each choir got up on stage and proudly sung along to their school song with conviction whilst a heart-warming film clip accompanied their performance. Below is a photo of the shark lanterns strung up in the trees beside the stage. The sharks were made using the same materials mentioned above. On the Saturday morning we wandered the beach before going to watch an Indigenous female basketball match. Before heading home, we plucked a piece of turtle from the BBQ and chewed it all the way back to the car. Needless to say, I’m no longer seeking out turtle of the cooked variety from this day forward. Adrian and I now call this place home so it’s been pretty exciting for us to share the quirks and perks of Groote Eylandt with some like-minded Melburnians. While the girls head back home next Monday, the night before they depart, we will welcome another new face into our home. Although our house is currently bursting at the seams, there’s no such thing as ‘free time’ and Adrian’s ears are inundated with teacher talk, we don’t regret volunteering for this experience. We feel very lucky to be in the position to expose others to such a unique place and show them how different life can be while still living on the same continent.